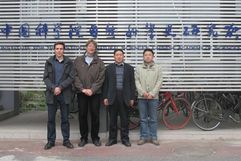 At the end of October 2011, Dirk Forschner and Philipp Mahltig travelled to Beijing for a first research journey of “Making Technology Appropriate”, a research project funded by the DFG (German Research Foundation). Apart from vital exchange with colleagues of the Institute for the History of Natural Sciences and additional Chinese experts, a special focus was put on the search for extant and well-conserved artefacts that could serve as an example of Sino-German technology transfer. Regarding the research project a well-preserved Romanian steam locomotive that was manufactured according to German construction blueprints of type series 50 is of further interest.